These muffins embody everything I was trying to achieve. No butter, no eggs, and no mixer needed. Fluffy, soft, light, moist, and they’re vegan. And they remind me of mini donuts, a huge bonus. I have many vegan banana muffin recipes from circa 2009, but they’re anything but light and fluffy. They’re made with almond meal to keep them gluten-free and are much heavier. I have more recent banana recipes, to the tune of, oh about 35+ Banana Bread recipes. You can never have too many, right? But they’re not vegan. Although some use oil rather than butter, they all use eggs. Because I loved the Pineapple Coconut Oil Banana Bread, I figured muffins and mini muffins would be fun, and kept them vegan. I’m not vegan (I’m vegetarian), but many of my readers are, and some readers watch their egg consumption for health reasons. Plus, sometimes it’s nice to be able to bake vegan if you run out of eggs. Whoops. I used Kelapo Coconut Oil Pre-Measured Baking Sticks. They’re pre-measured into half-cup portions and scored the way butter is, which is so handy for baking. Of course, using coconut oil from a jar is just fine. As I’ve discussed before when baking with coconut oil, it doesn’t impart much flavor. There’s barely a hint of detectable coconut flavor in these muffins, perfect for those who aren’t as fond of coconut. Normally when people object to coconut, it’s usually shredded or flaked coconut, which are very distinct and powerful, far stronger than coconut oil. The flavor the coconut oil lends to the muffins is of the can’t-put-your-finger-on-it type. Combined with the sweet bananas, vanilla almond milk, and heavy dose of vanilla in the batter, I was in fluffy, fragrant muffin heaven. I baked 24 mini muffins using a rounded tablespoon of batter. Spray your tablespoon with cooking spray, repeating as necessary, so the batter glides right off into the pan because filling up mini muffin pans can be messy. After two pans of minis, I made 7 regular-sized muffins in a standard muffin pan and used a one-quarter cup measure. Fill both the mini and regular pans to between two-thirds and three-quarters full. You’ll be surprised how much this batter rises and the ones that were filled more than 3/4-full ended up turning into overgrown mushrooms. I have a knack for that. I want muffin top, not mushroom top. I suspect they’d make great donuts and baking as a loaf would likely be okay as well, but there’s something about the individualized aspect of muffins that lends a special poppable quality you won’t get as a loaf. They bake in quite a hot oven to ensure the high heat gives these egg-less wonders as much rise and doming as possible. Watch them closely in the last few minutes of baking so they don’t burn. Baking times will vary based on what size pans you’re using. I baked the mini muffins for about 9 minutes and the full size for 15 minutes. Bake until they’re done. Watch your muffins, not the clock. They’re done when a toothpick inserted in the center comes out clean or with a few moist crumbs and they’re domed and springy to the touch. They’ll be more pale than golden. I dipped the tops in cinnamon-sugar. Everything is better coated in cinnamon-sugar. I didn’t even need to brush on melted coconut oil (or vegan butter) for the coating to adhere. The sugar granules add lovely texture and remind me of eating mini-donuts. Except baked and vegan, nice. They’re surprisingly light and fluffy for an egg-free muffin, which are often more like dense, lead balloons and also came out so soft and moist, thanks to the coconut oil and bananas. The smell in your house while they bake is heaven-sent. Bread baking with bananas, vanilla, and coconut oil is beyond scrumptious. I popped them in one after the next. Just one more. And one more. The ones we didn’t immediately scarf actually got softer on the second and third days, and the flavors intensified; mini food really does taste better. Preheat oven to 400F. Spray non-stick muffin pans with Kelapo Coconut Oil Cooking Spray, or grease with coconut oil and flour the pans. (I prefer cosmetically to not use liners, and also the muffins could stick) I made 24 mini muffins and 7 regular muffins. I estimate the recipe will make 30 to 36 mini, or 16 to 18 regular-sized muffins. Set pans aside. In a small bowl, mash the bananas; set aside. In a large bowl, combine flour, baking powder, 1 teaspoon cinnamon, nutmeg, optional salt, and stir to incorporate; set aside. In a medium bowl, combine 1 1/4 cups granulated sugar, melted coconut oil (about 1 minute in the microwave), slightly warmed milk (about 20 seconds in the microwave – this prevents the cold milk from re-solidfying the coconut oil on contact), brown sugar, vanilla, and whisk to combine. Fold in the bananas. Pour wet mixture over the dry, stirring until just incorporated. Make sure to get all the dry bits from the bottom of the bowl, but don’t overmix or muffins will be tough. Batter is quite thick and if yours is seemingly too thick, add a splash of milk to thin it. Using a cooking sprayed one-tablespoon measure for a mini muffin pan or a sprayed one-quarter cup measure for a regular sized pan (or what is appropriate for your pan size). Fill the cavities between 2/3 and 3/4 full; don’t exceed 3/4 full. Bake until done. A toothpick inserted in the center should come out clean or with a few moist crumbs, but no batter. Tops will be domed, springy to the touch, and will be on the paler side rather than golden. Done for me was about 9 minutes for mini, 15 minutes for regular sized. Baking times will vary widely based on size of pans used, how many pans you have in the oven at once, how moist your bananas were, and how many times you open the oven door to rotate pans. Watch your muffins, not the clock. Allow muffins to cool in pan for about 10 minutes before carefully turning out onto wire racks to cool completely. 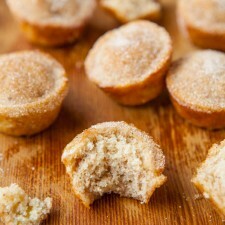 If desired, after they’re cool enough to handle, stir together about 1/3 cup granulated sugar and 1 tablespoon cinnamon, and dip the tops (or entire muffin) into it. I didn’t need to brush with melted coconut oil or (vegan) butter in order for the cinnamon-sugar to adhere. 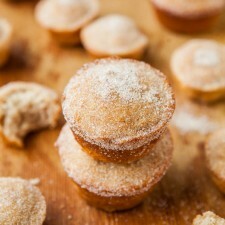 Muffins will keep airtight at room temperature for up to 5 days or can be frozen for up to 3 months. They get softer and the flavor intensifies on the second and third day. I personally can’t wait to try this recipe and many others on Averie’s Blog. Make sure to follow her on Twitter, Facebook, and Pinterest for other delicious recipe ideas…some may even incorporate coconut oil!